“The problem and worrying about that problem are two separate things,” replied Rosh. “I didn’t mean, do nothing about the problem." “What is much more effective is a constructive diversion. Asking yourself, ‘Can it be fixed?’ or ‘What can I do to fix it?’ starts you down the path to this constructive diversion." "Kind of like a reverse Voodoo doll?" Isha asked. "Expressing and sharing it," Isha nodded, "helps unlock and release pain. It makes the feelings lose some of their intensity. Do you think it works similarly with sharing worries?" “I think it helps crystallize the worry, if nothing else," said Rosh. "Sharing worries with other people can help pool minds to seek quicker, and generally better solutions to problems." 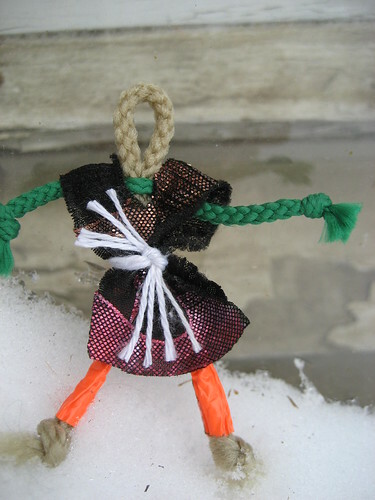 Note: Reportedly, a version of this doll (Hope doll ‘Tsunamika’), has also been made and distributed in Indian coastal areas of Pondicherry, Tamil Nadu and Andhra Pradesh since 2005. There, it is also in use as the logo of the National Coastal Protection Campaign.